Surely the kid inside all of us loves a bit of Lego now and then? Well these campaign mock ups by the Access Agency are right up me and my inner-kid’s street (hmm, that made sense in my head). In fact for many creatives it’s not just the inner child that loves Lego, but the outer adult too, with Lego being used to create incredible animations, accessories and campaigns. Have to say I agree. 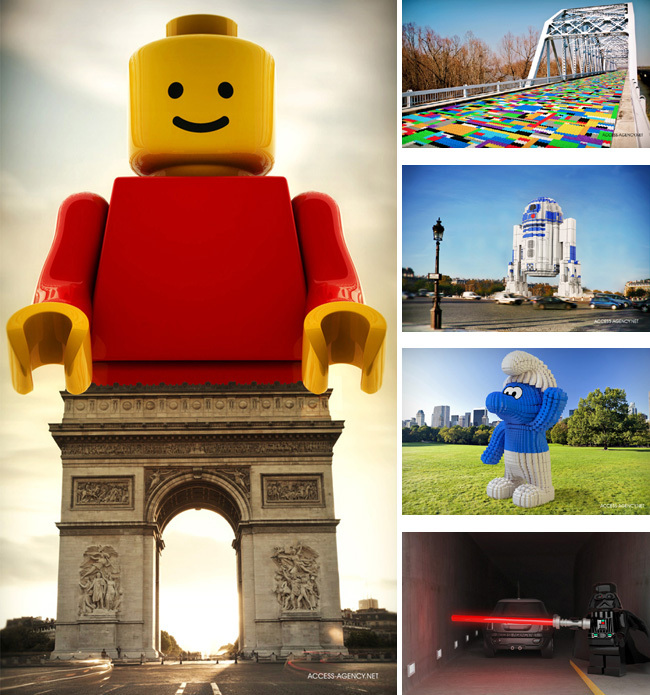 I’d love to see a giant Lego man completed by Arc de Triomphe legs, or a Lego Darth Vader using his lightsaber as a car park barrier. Brilliant! This such an amazing idea! I really hope they do it, even though I was never a major lego fan, but imagine giant barbies haha, that just wouldn't work! I would love to see that colourful brige, just am not too sure it could take all the pressure of the cars! Haha giant Barbies would be all kinds of awesome. They could hold up bridges or something? Or have one looking like it's pushing the Leaning Tower of Pisa over. Haha.